MOSCOW, Russia (CNN) -- U.S. Secretary of State Hillary Clinton stressed Tuesday that Washington and Moscow are working together to ensure Iran's nuclear program is strictly for peaceful purposes, but Russia has stopped short of committing to Iranian sanctions. Russian President Dmitry Medvedev greets U.S. Secretary of State Hillary Clinton on Tuesday outside Moscow. Speaking to reporters after a closed-door meeting, Clinton and Russian Foreign Minister Sergey Lavrov indicated there has been no agreement between the countries on any sort of sanctions plan, even though Russia is not opposed to sanctions in principle. The United States is using a two-track approach, pursuing diplomacy with Iran and going on to stronger measures -- such as sanctions -- if that effort fails. "We are aware that we might not be as successful as we need to be," Clinton said. "So we have always looked at the potential of sanctions in the event that we are not successful, that we cannot assure ourselves and others that Iran has decided not to pursue nuclear weapons." While the Obama administration has been cautiously optimistic about the "inevitable" comment, Russia has long believed that sanctions are not yet necessary, even though they may be a factor to consider down the road. Lavrov said that sometimes sanctions theoretically need to be imposed when all diplomatic efforts are exhausted -- but not in the case of Iran. "Threats, sanctions and threats of pressure in the current situation, we are convinced, would be counterproductive," he said. World powers have long been concerned that Iran wants to build a nuclear weapon, and those suspicions were heightened by the discovery of a secret uranium enrichment plant near Qom. However, Iran has consistently said it is developing nuclear power for peaceful purposes. "Iran's nuclear program remains a matter of serious concern. We're working closely with Russia through the P5 and 1 process," Clinton said, referring to the diplomacy with Iran conducted by Germany and the five permanent members of the U.N. Security Council -- the United States, Britain, France, China and Russia. "We are working to ensure that Iran moves forward with us on this engagement track," said Clinton, who added that Iran must show without any doubt it is pursuing unequivocally only a peaceful use of nuclear power. 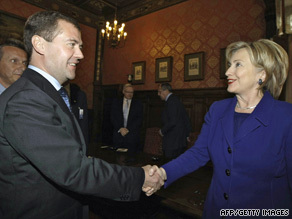 Clinton also met with Medvedev at his residence outside Moscow. Other items on Clinton's agenda included Afghanistan, arms control and the new U.S.-Russia bilateral presidential commission. Clinton spoke about surmounting historical difficulties in U.S.-Russian relations, changing a relationship "once defined by the shadow of mutually assured destruction into that based on mutual respect and over time increasingly mutual trust." "We are different countries; we have different historical experiences, different perspectives," she said. "But we are planting those disagreements in a much broader field of cooperation, and hopefully we are enriching the earth in which this cooperation can take root." CNN's Jill Dougherty contributed to this report.